KUALA LUMPUR: Market capitalisation for Real Estate Investment Trust (REIT) in Malaysia is expected to grow by 30 per cent to RM20 billion this year from RM15 billion last year, an industry player said. Sunway REIT Management Sdn Bhd chief executive officer Datuk Jeffrey Ng said the increase will come mainly from the listing of IGB Corp Bhd's REIT in the second half of this year. "The IGB REIT listing is worth between RM3.5 billion and RM4.5 billion. We are confident the market value could reach RM20 billion this year," he told reporters after the opening of the Real Estate Investment Trust Conference 2012 by Housing and Local Government Minister Datuk Seri Chor Chee Heung, yesterday. IGB, a general construction and real estate developer, operates through four business segments, namely property development, property investment and management, construction and hotel. The company's initial investment portfolio on Bursa Malaysia Main Market will comprise eight-storey retail mall called "The Gardens Mall" and its five-storey retail mall "Mid Valley Megamall". On the industry performance and outlook, Real Estate and Housing Developers' Association Malaysia president Datuk Seri Michael Yam Kong Choy said the industry has been robust in the first half of this year. Going forward into the second half, he said, the market is expected to moderate, awaiting a fresh moving factor. 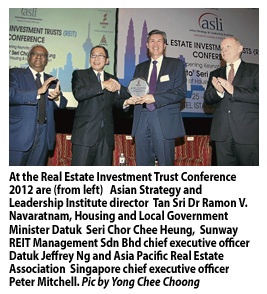 Organised by the Asian Strategy and Leadership Institute, the REIT Conference 2012 brought together key decision makers, policymakers, sector players, property developers, asset managers, investors and consultants to share experience and forecast outlook and opportunities in the REIT market. The conference will, among others, discuss new trends and the industry's development.